With Biltmore, George Vanderbilt created a magnificent setting in which to house his treasures from around the world. 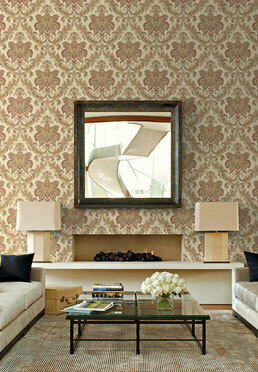 Even the wallcoverings of America’s Largest Home® were chosen with great care. Inspired by many original elements of Vanderbilt’s estate and beautifully landscaped grounds, this collection highlights classic, sophisticated designs that bring timeless style to your home. If you are unable to find a retailer in your area, please contact Wallquest at 610-293-1330. Tapestry damask with raised ink. Crafted exclusively for Biltmore by Wallquest Inc.